I’m pleased to tell you that Cilla is back at Milton Keynes – by popular demand and I’m not surprised one little but! CILLA – THE MUSICAL is the spectacular and heart-warming musical adaptation of the critically acclaimed hit ITV television series by Bafta-Award winner Jeff Pope (The Moorside, Philomena, From The Cradle To The Grave, Mrs Biggs and the acclaimed Little Boy Blue which had ITV audiences glued to their screens). It tells the extraordinary story of the ordinary girl from Liverpool whose teenage dreams of stardom lead her to becoming one of Britain’s best-loved entertainers of all time. 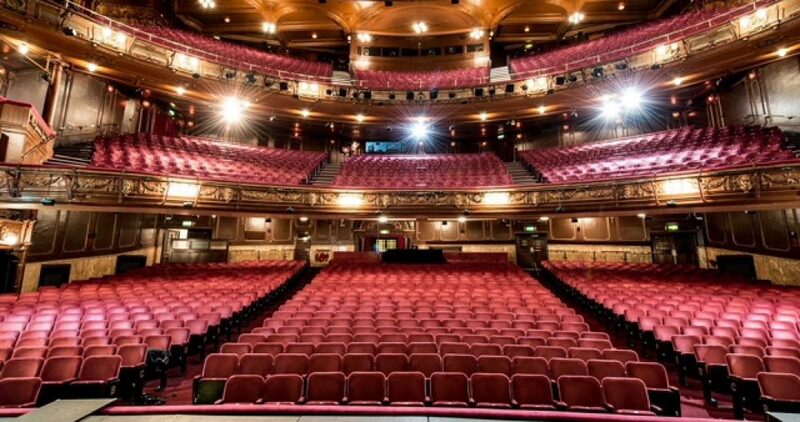 Milton Keynes Theatre has done well to get Cilla – The Musical so soon after it’s world premiere at the Liverpool Empire on 7th September this year. 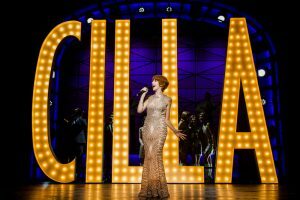 Bill Kenwright’s new musical features: Kara Lily Hayworth as Cilla, who beat thousands of hopefuls in nationwide open auditions for the coveted role. Andrew Lancel (Brian Epstein); Carl Au (Bobby); Bill Caple (Ringo Starr); Joshua Gannon (Paul McCartney); Michael Hawkins (John Lennon). 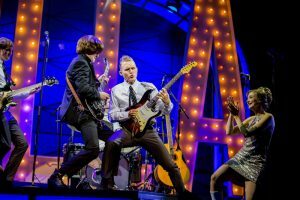 The legendary Merseybeat sound is authentically performed live on stage by the cast who are completed by: Alan Howell; Jay Osbourne; Alex Harford; Will Kinnon; Jenny Murphy; Tom Sowinski; and Christopher Weeks. I was fortunate enough to be at the opening night in Milton Keynes – and it was an amazing experience! Previously after seeing very many Bill Kenwright productions I thought he’d hit a high with Joe McElderry as Joseph, but Cilla – The Musical is without doubt Mr Kenwright’s finest so far! The lavish sets, the music as close to the original as it is possible to be all served to create the perfect atmosphere for our visit back to those days when pop music was changing, in fact young people in general were beginning to realise that new music was theirs and not meant for the middle aged who were still worshipping the crooners of the previous decade! Kara Lily Hayworth is stunning as a performer and absolutely perfect in the role of Prescilla White who very soon became Cilla Black. Kara most certainly held her own alongside seasoned performers such as Andrew Lancel (a moving performance as Brian Epstein), Pauline Fleming as Big Cilla and Neil Macdonald as Cilla’s father John White (“I know about these things, I was in the Merchant Navy!”) – and the night was hers! The rest of the cast, actors and musicians all were wonderful and the sounds they re-created took those of us of a certain age straight back – it was real, there’s no doubt! I’m sure this will sell out this week and it should move into London if all’s fair, but if you can manage to get a ticket you’re in for a theatrical treat! Benidorm hits the spot in Milton Keynes. Benidorm at Milton Keynes Theatre until 20th October. Starring Jake Canuso (Mateo), Janine Duvitski (Jacqueline), Adam Gillen (Liam), Sherrie Hewson (Joyce Temple-Savage), Shelley Longworth (Sam), Tony Maudsley (Kenneth) and featuring Neptune’s very own Asa Elliott, the official world premiere of Derren Litten’s smash-hit ITV comedy Benidorm is set to bring sunshine and smiles to the UK and Ireland in the stage debut production of the hugely popular TV show. A dose of Benidorm sunshine with your favourite stars from the Solana live on stage for the very first time. 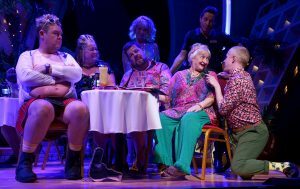 Benidorm is at Milton Keynes Theatre until 20th October. I hadn’t a clue how the popular television series would transform onto the stage, but I needn’t have doubted it. With a packed theatre bursting with Benidorm fans, a set that worked well as the reception, poolside, bar and function room of the Solana Hotel! This with the added attraction of the same stars that appear in the TV series recreating their roles, the show was great fun from beginning to end. Good idea to have a 12+ rating as some of the material is not offensive, but certainly adult. Ibsen this aint, but if you like Benidorm the series then you’ll love this! You’ll be lucky to get a seat though! Vulcan 7 at The Cambridge Arts Theatre “is Hilarious”! 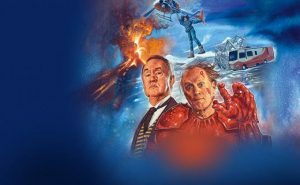 This new comedy is written by and co-stars Adrian Edmondson and Nigel Planer. Gary Savage (Adrian Edmondson) and Hugh Delavois (Nigel Planer) were students at RADA together. Now in their sixties, they meet in an Icelandic wasteland, on the set of a fantasy movie “Vulcan 7”. Hugh has had a plodding career but has landed the role of Vulcan’s butler – a small but regular role – and he’s making his seventh film for the franchise. Gary is a has been Hollywood A-lister who has fallen on lean times and is playing a guest monster with four hours in make-up and one word in the script. The cast is complete when Lois Chimimba appears as the movie runner who referees the constant tension between the two actors. The show is hilarious and fans of Ade and Nigel will not be disappointed, the characters are totally believable and once the tension and history between them is established that takes the background as the drama of what is to become of them stranded in this caravan perched on the side of a ravine – the opposite side to the catering trucks – takes over. This is a must see, if you enjoy the work of either of its stars you will have a brilliant night of theatre. But please note there is an age guidance of 14+ which could also apply to maiden aunts as the language does get a bit colourful at times! .